Are you a foreigner in Copenhagen? Do you like to follow the news in other languages? Try Library Pressdisplay. It gives you free access to foreign newspapers. Copenhagen Libraries offers a free newspaper service that you can access from home. 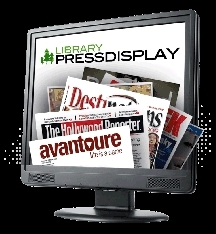 Library PressDisplay gives you access to more than 1000 newspapers from at least 80 different countries all over the world and in about 40 different languages. All that it requires is that you are a member of Copenhagen Libraries and that your postal address is inside the municipality of Copenhagen. You use your ordinary library log on to enter the newspaper database.